I’m back with another baking post after my last one didn’t work out so great. Well, it tasted nice but I needed to perfect it aesthetically otherwise my pictures would have looked like a hot mess. 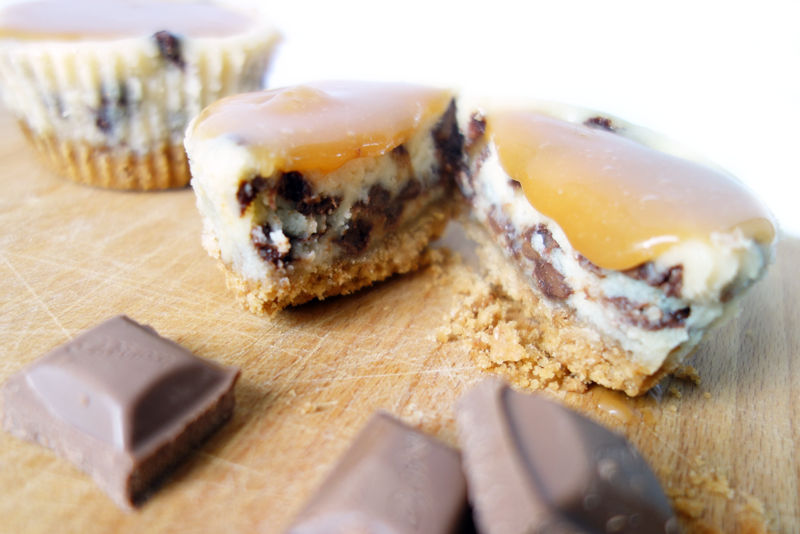 Anyway, this week it’s chocolate chip cheesecakes with a salted caramel sauce – delicious right? You’re quite correct. Step One | Preheat your oven to 350F / 175C / Gas Mark 4 and line a cupcake pan with roughly 18 liners. Step Two | For the base: Break up the digestives into crumbs (either by hand or in a food processor) and mix together with the melted butter. Press one heap tablespoon of the mixture into each liner and bake for 5 minutes. Allow to cool slightly as you prepare the filling. Step Three | For the filling: Beat the cream cheese (by hand or in a mixer) until smooth. Add the sugar and yogurt and mix until combined. Add the eggs, one at a time, mixing until incorporated. Add the vanilla extract and chocolate chips. Spoon into the cases until nearly full and bake for 20-23 minutes. The centers will be slightly wobbly and will sink a bit. Allow to cool then transfer to the fridge for at least two hours. Step Four | For the sauce: Heat the sugar in a saucepan on a low-medium heat until it becomes a amber coloured liquid. I didn’t stir this (even though it says you should), I just moved the pan around so it didn’t burn which I thought worked well. Once liquid, add the butter. Be careful as it will spatter a little and bubble up. 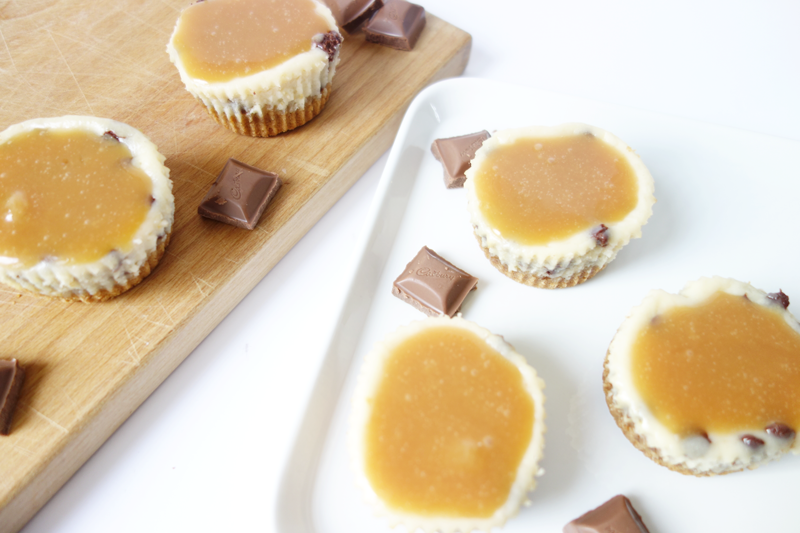 Carefully swirl everything round until it’s melted completely. Slowly drizzle in the cream (again, it will spatter) and move around until incorporated. Remove from the heat and add the salt. Step Five | Allow to cool slightly before adding it to the cheesecakes. 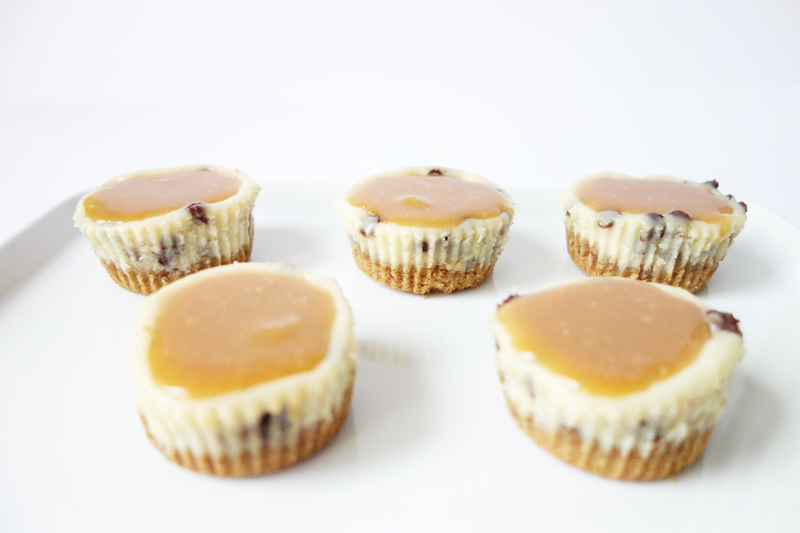 You can store the cheesecakes in the fridge for up to five days and the sauce for up to two weeks. Just warm the sauce slightly before use! And that’s it, cheesecake done. Be careful with the sauce, it took me three attempts to get it right as I heated it up too quickly. Patience is a virtue and all that. Trust me, the butter splits and goes all weird if it’s too hot. Other than that, it’s a super quick and easy recipe to do and tastes pretty darn good if I say so myself. 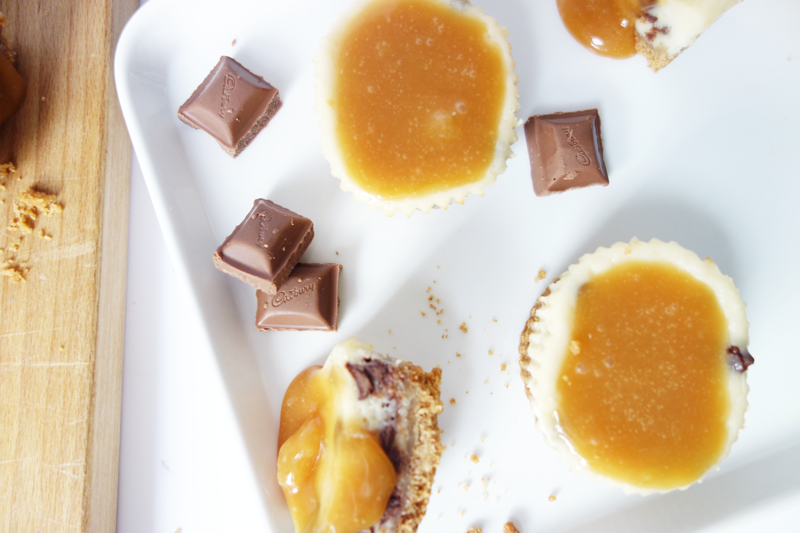 Perfect for a weekend bake (oh and the recipe halves really well too!) – enjoy! Make sure you’ve entered my £250+ beauty giveaway! It ends this weekend. Next Post TODAY: It’s My Birthday!